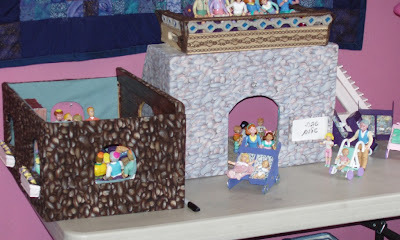 Last summer, at my kids' request, I made a shul (synagogue) for their dolls. It was a hit, and it was enjoyed throughout the year. After a year, however, it needs repair. The girls have been asking me to restore it to its former glory. 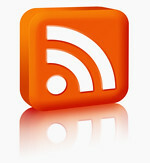 Since I have this blog, I plan to document the repairs and replacements as they are made. 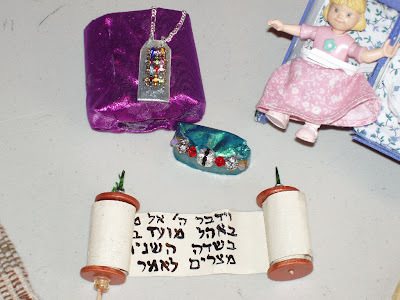 The doll shul was elaborate, with many accessories. I snapped a couple of pictures of the building process, but none of the finished product. 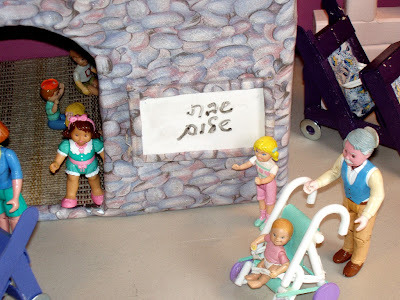 A few months later, my sister visited, and insisted on taking a few pictures of 'our shul' when she saw the girls playing with it. Today, a year later, the frame remains in good condition, but the ladies' section and most of the accessories need to be replaced. 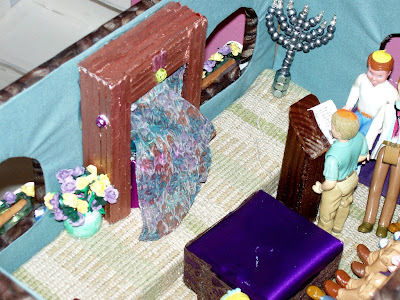 I used fancier materials than we normally use for one of our standard doll houses, in order to show honor for the synagogue in the abstract, and for the Torah and its accessories. 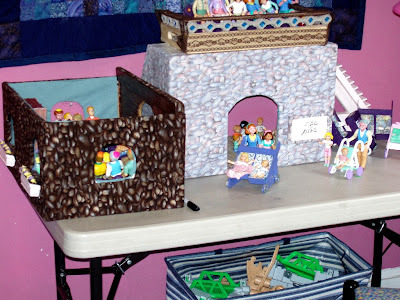 I gave up some of my real beads and fabrics, and spent more time on it than one of my 'normal' dollhouses. 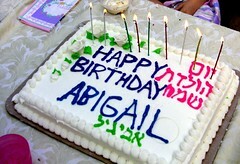 I wanted there to be room for a at least whole minyan (10 men) of men, and a comparable number of seats for the ladies. I wanted the Torah and its accouterments to be somewhat accurate for both educational and play value. If an idea resulted in something too fragile or dangerous for play, the idea was discarded, no matter how cute/clever/fun it was. 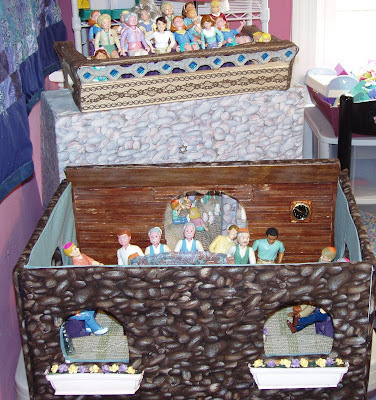 I wanted the shul to be a toy that many children could play with at once. I wanted my four daughters and their visiting friends to be able to play simultaneously without having to fight for space. 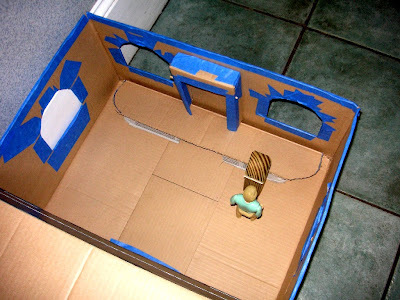 I wanted the boxes to be storage-friendly and easily able to move from room to room mid-game. This is what the finished shul looked like. The men's section is on the left, covered in fabric that looks like brown stones. The main entrance, leading to the social hall on the right, covered in fabric that looks like grey stones. On top of the main entrance, there is the (removable) ladies' section, which is a balcony that overlooks the men's section, when the doorway-arches of the men's section and the front entrance are aligned. There's a pink staircase for the ladies to get to the balcony (far right). And this is the view facing "East." The Torah had the first sentence of each of the five books written on it. duct tape and painted or covered with fabric and beads. The breastplate was a Popsicle stick, painted silver and adorned with beads and a chain. The yad (pointer) was a bit of wire attached to a chain. 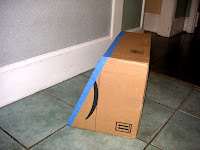 I started with a pair of identical cardboard Amazon boxes. 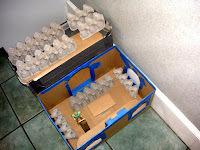 The basic structure involved two boxes and a tray. The first box, held vertically, with the opening on its side, formed the front entrance of the shul and the social hall. 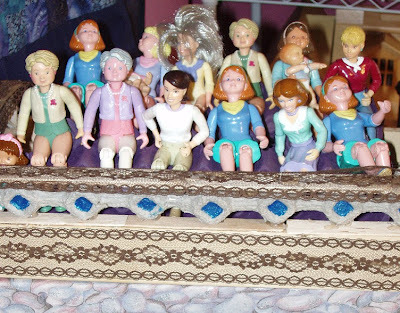 On top of the first box, the tray held the ladies' section. The ladies' section is a balcony overlooking the men's section. Since this was on a tray, it could be removed and played with separately. The second box, held horizontally, with an opening on the top, formed the men's section. It has four walls and no lid. The big arch opening is the same size as the arch opening in the first box, so they can line up. It was important to measure this arch on the second box first, and then use it as a guide on the first box. Otherwise, the doorway/entrance to the men's section might have been too big for the box size! The aron was made from some bits of the cardboard that had been removed from the first box. Later, the aron was covered with wooden coffee stirrers. It was painted brown. 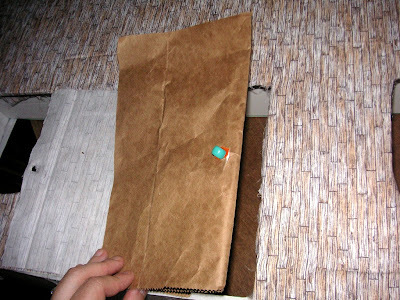 A pony-bead was glued to either side of the skewer hole, to help guide the skewer/curtain rod and to keep its ends hidden. Bits of coffee stirrer were painted to look like two tablets, and they decorated the top of the aron. A crystal bead was glued to the top of it to look like the "eternal light". The amud (podium) was made by glue-gunning a bit of a coffee stirrer to a sanded piece of scrap wood. 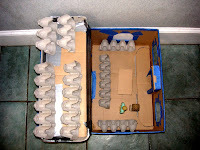 The shape of the bima (platform/stage) was made from bits of egg carton and cardboard. 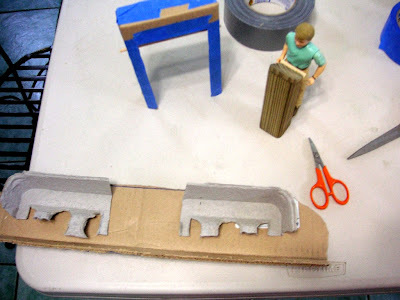 The bima (platform/stage) was reinforced with duct tape and filled with Styrofoam 'clay' to make it sturdy. 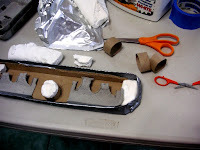 Sections of paper towel tube were stuffed with with Styrofoam clay, and then the rest of the volume were filled snugly with more Styrofoam clay. It dried overnight and became solid and firm. The 'pews' of chairs were made from egg cartons. 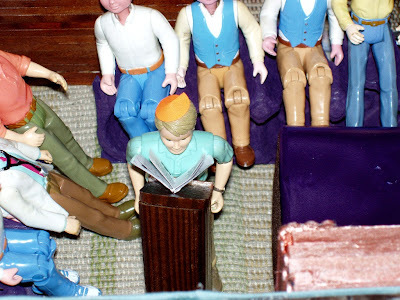 It turns out, that egg cartons are the PERFECT size to be chairs for 1:12 scale dolls (such as Fisher Price/Playskool Loving Family sized dolls. Fashion Polly dolls can plausibly sit in them, too. One egg forms the seat, a second is the chair base. This is the top view, with the ladies' section balcony on the left hand side of the picture, and the men's section to the right. The amud is to the far right, at the bottom. There are 14 seats in the men's section and 18 seats in the ladies' section. Here are some of the shul's beta testers. Ultimately, the tray/ladies' section was the most popular section, and that is why it no longer exists! 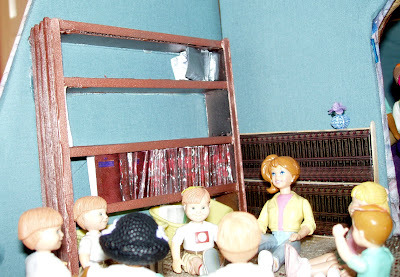 The large (left hand side of picture) bookcase was made from coffee stirrers and painted. It is "built-in" (i.e. glue-gunned to the walls). 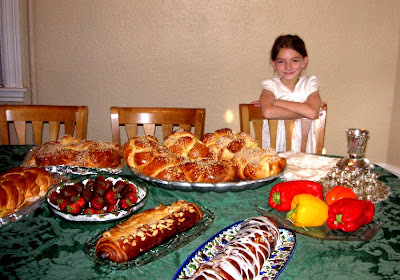 It is filled with mini-siddurim. We lost all of these, and I plan to replace them, with a tutorial on this blog, soon. The shorter bookcase (on the right) has a set of non-removable Talmud, clipped from an Artscroll catalog and glued to a piece of foam-core. 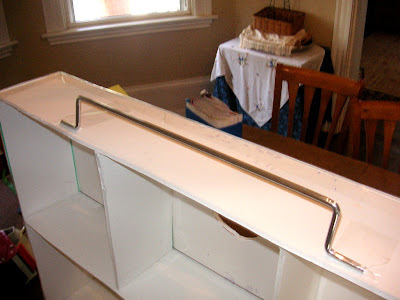 The "bookcase" was built around it, from coffee stirrers. There is a bit of a cardboard whiteboard at the front entrance for announcements. 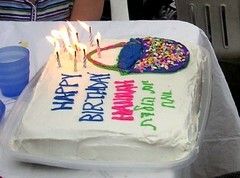 That's my sister's handwriting! The sign on the staircase says, "Stroller Parking". Just like our real shul, strollers must be left outside. My kids insisted on this! 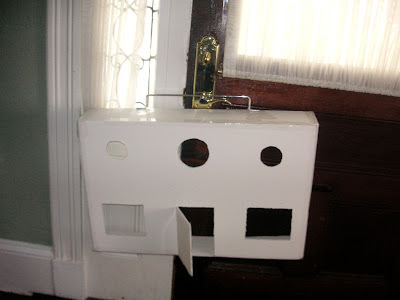 I made them from broken plastic hangers and Must Gum boxes, mostly. The girls have been asking for more of these, so I hope to have a tutorial in the coming weeks. by Juggling Frogs at 7:47 AM 14 comments, so far. Add yours now! 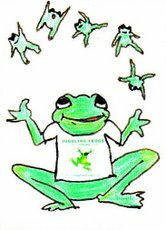 by Juggling Frogs at 12:00 PM 10 comments, so far. Add yours now! by Juggling Frogs at 8:11 AM 0 comments, so far. Add yours now! 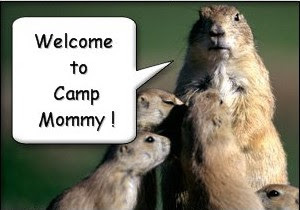 This is our fourth year 'uncamping', and we love it! 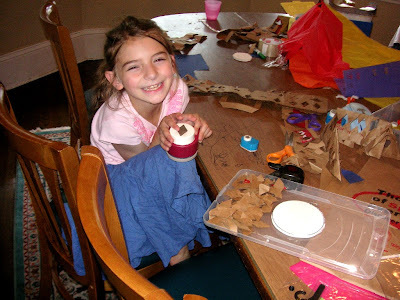 Now that Tisha B'Av is over, we can concentrate on crafts. 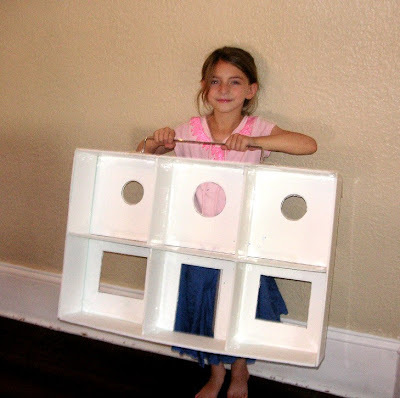 The goal is a cheap and easy, durable doll house frame for the kids to decorate. 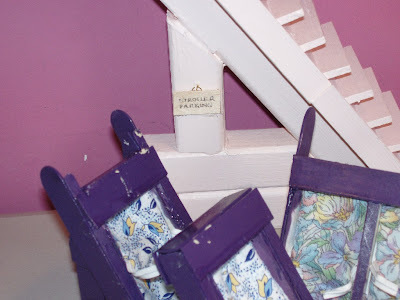 I like to make these dollhouses very shallow (5"), to take up minimum floor space in the kids' rooms. 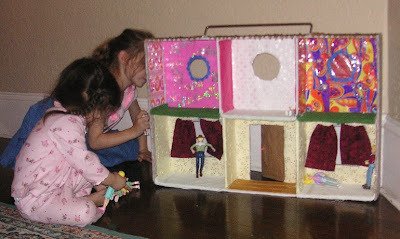 This size house would be suitable for any standard 1:12 (1"= 1') scale doll. (i.e. 10" storeys would be 10' ceilings.) 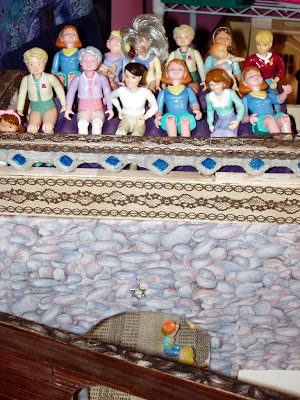 The Fisher Price/Playskool "Loving Family" dolls are in this scale. 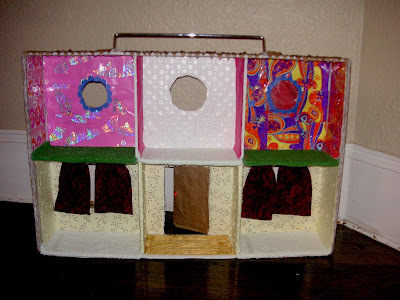 Fashion Pollys are smaller, but this size house works well with that size too, as long as the children don't care about scale. This is a play doll house (as opposed to 'heirloom' style), with no pretensions of outlasting a couple of active seasons of active play. Decorating the house takes as long as you'd like. 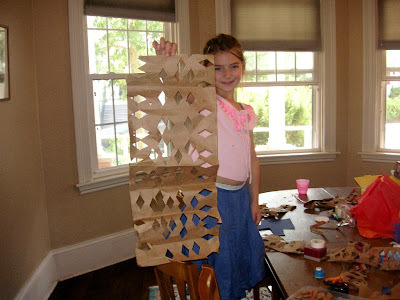 It can take zero time (just let the kids use the bare white frame) or days (for something elaborate and well-executed.) Sometimes, we've let the kids go wild with magic markers and crayons, and let them decorate it however they like. Today, Emily wanted me to help her decorate it 'according to her vision.' 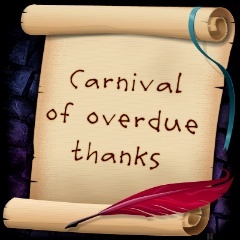 So we worked on a kid-style, kid-designed, medium-quality, medium-effort design that took abut half a day to complete. 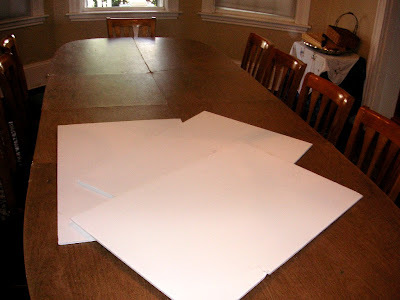 We started with three 20"x 30"foam core boards. Board A: Face of building: mark vertically in 10" wide increments. These will be the guidelines for placing the walls. This board will be used whole. 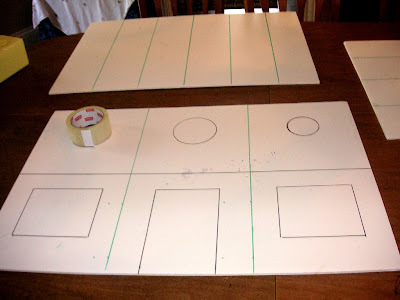 Board B: Floors: Mark the board in 5" wide horizontal lines for cutting the roof, and floors of the dollhouse. 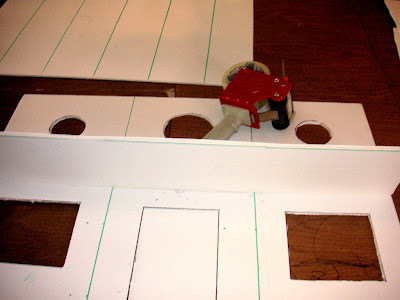 Board C: Walls: Mark the board in 5" wide vertical lines for cutting the interior and exterior walls of the doll house. On Board A, make a horizontal line at 10" as a guideline for the middle floor. Mark where the windows and front door will go. 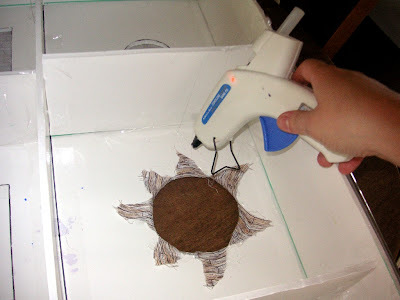 For small round windows, trace the interior diameter of the packing tape. 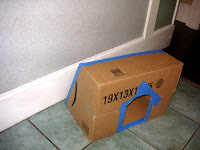 For large round windows, use the exterior of the packing tape as a guide. 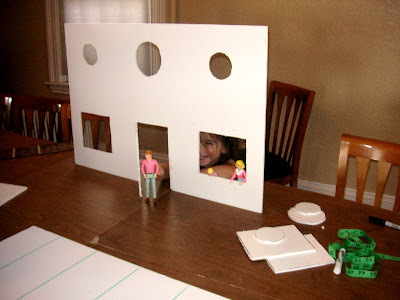 Cut out the windows using a craft knife or scissors. Cut through one side and the top of the door. Score the other side of the door, on one side of the foam core, leaving the other side of that side of the door intact. Do not fret if you cut through the whole door by mistake. It can be reattached, using duct tape or medical tape as a hinge. 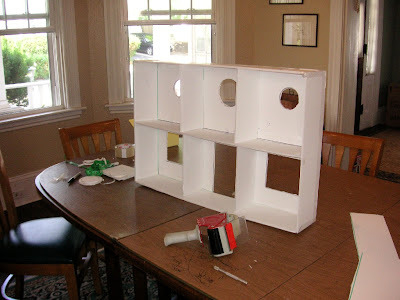 Save all the cut-out parts of foam-core throughout this project to make doll house furniture. Test the door, and the sizes and heights of the windows before continuing. 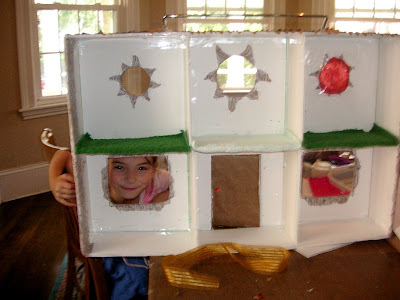 The window openings should be large enough for little hands to reach through them, without getting stuck. 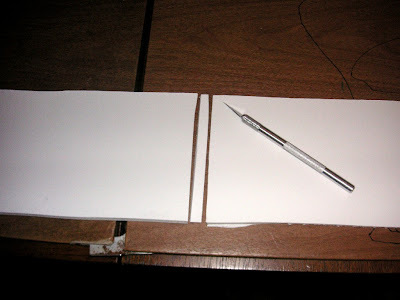 Cut Board B and Board C on the lines drawn earlier. The long boards will be the floors, and the short boards will become the walls. Three floors and two walls will be used as is. The remaining pieces can be cut to fit, to become the interior walls. 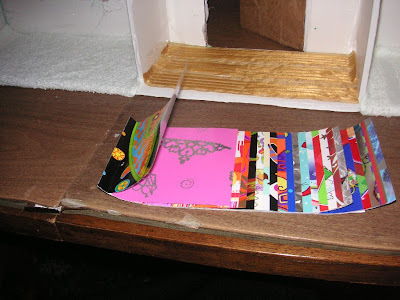 FIRST attach the middle floor, with clear packing tape, using the horizontal guide-line on Board A. 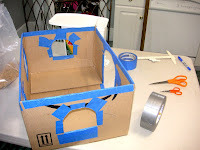 SECOND, add the exterior walls and secure with packing tape. 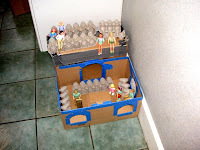 THIRD, add the roof and bottom floor with clear packing tape. These will go on the outside of Board A. 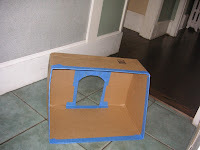 FOURTH, once the top and bottom are attached to Board A, use more clear packing tape to attach the top and bottom floor snugly to the outside walls. 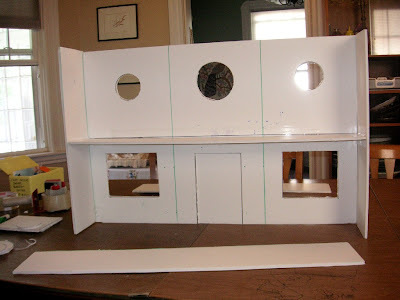 Make interior walls, using a full wall-length width from Board C. To account for the space taken up by the middle floor, slice out 1/2" (roughly) from the middle of the piece. Generously tape everything, inside and out. The more tape, the stronger the frame. Test how it stands. Try to put pressure on the roof, etc. Your kids will surely test it once it is done! Congratulations! The frame is done! 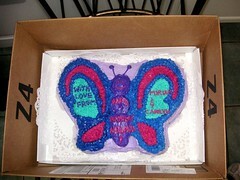 At this point, the kids might just walk off with it, allowing the adult to go on her merry way. Or they might want to decorate it by themselves. To make a doorknob, a parent can help by poking a small hole in the front door with a craft knife. We have used brads and beads in the past. Kids have made their own holes with sharp pencils, too. It is best if an adult does this part, however, because it is easy to break the door. Attach a handle to the roof. 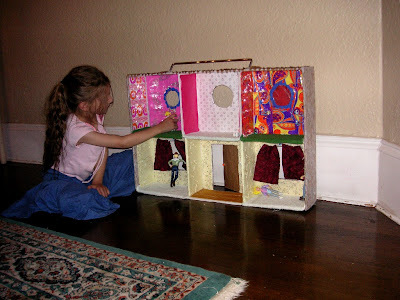 Emily wanted to be able to hang this doll house from a hook near the top bunk of her bunk-bed. 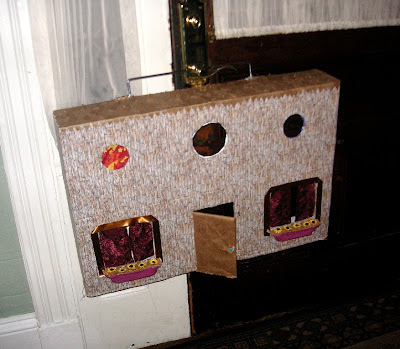 She also wanted to be able to carry the house easily from room to room. This is one of 5 "shelves" made of wire that were part of a broken towel rack. Clothes hangers, (or snipped wires from them) can be used to make a handle. 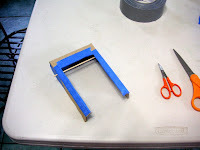 Alternatively, you can make two small holes in the middle of the roof, each about 1/3 from the outside walls, and knot rope or heavy-duty ribbon to make a handle. If you're adding a handle, this is a good time to perform a hang test. Here's Emily, testing the handle. 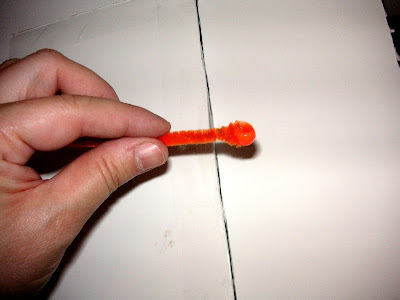 A quick doorknob is made from a pipe cleaner (They are now more commonly called "chenille stems"; I guess I'm dating myself calling them 'pipe cleaners' instead.) and two pony beads. Thread the tip of the pipe cleaner through the bead and twist to secure it. 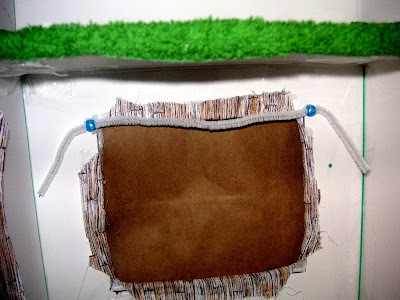 Thread the pipe cleaner through the door knob hole. 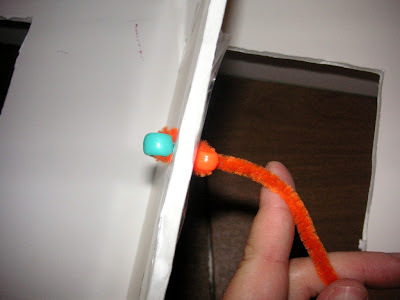 Thread the free end of the pipe cleaner through the other bead, and then feed it back through the door knob hole. (You will be back on the same side as the firs bead. Pull tight to secure. Wrap the pipe cleaner once around the outside of the first bead, then thread the pipe cleaner back through the bead. 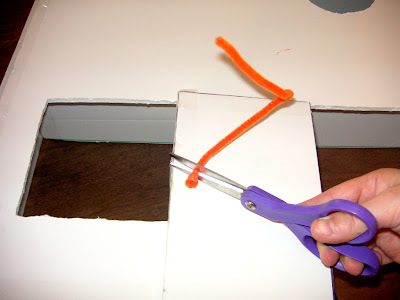 Trim the excess pipe cleaner. Emily wanted to make a stained-glass window. We took the foam-core piece that was cut from the window and taped it to the bottom of transparent plastic container lid, using packing tape. Emily worked from on the top of the lid, using the foam-core (that was taped under the lid) as a guide. 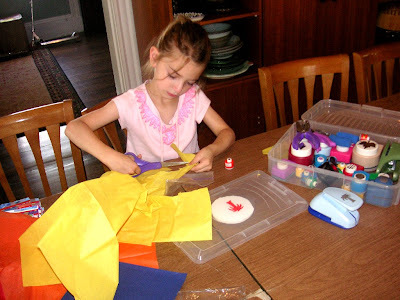 She cut shapes from colored tissue paper and arranged them on the plastic lid. 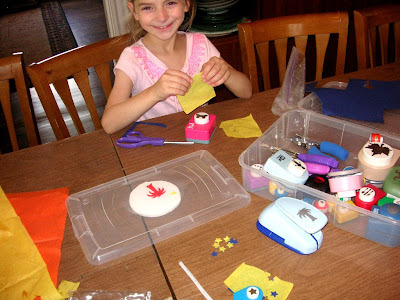 She used various hole-punches to make the shapes. 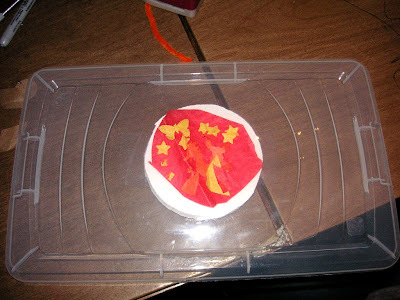 To prevent tissue paper from getting stuck in the hole puncher, place the tissue paper on top of a piece of regular-weight paper. To sharpen the hole puncher, punch aluminum foil. To "grease" it, punch waxed paper. When the final arrangement is complete, use clear packing tape to cover the design and an additional 1/2" perimeter completely. 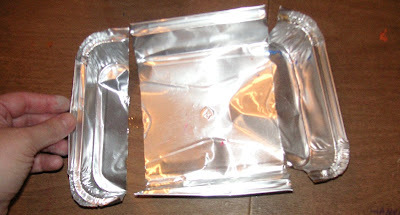 Peel the tape from the plastic lid, and cover the back with packing tape as well. 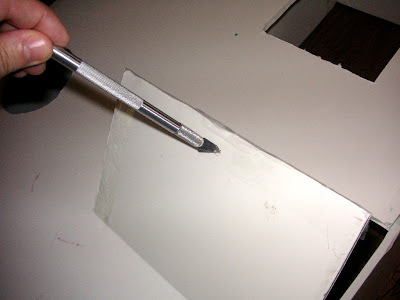 Trim the edges to 1/2" larger than the window opening. This was Emily's completed stained window design. "It's a fire breathing dragon at night with stars." After securing the edges of the fabric to the outside of the house with a glue gun, I cut out the fabric that covered the window openings. For the circular windows, start at the center of the opening, and cut multiple wedges toward the perimeter of the circle, erring on a too-small cut, rather than going past the perimeter of the window opening. 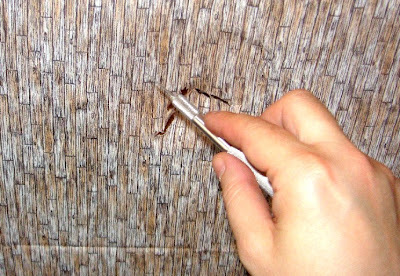 Pull the fabric (it will stretch) through the opening, securing the wedges to the interior of the house with a hot glue gun. This is what the interior of the house looked like, once the fabric was attached to the outside and the window holes were completed. 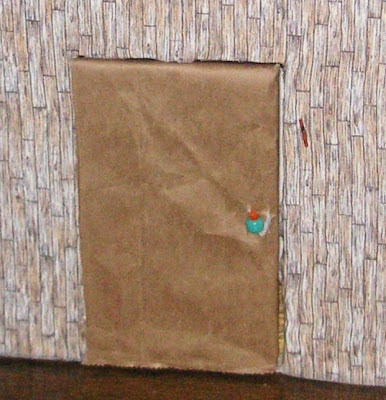 We covered the door with a piece of a brown paper shopping bag. 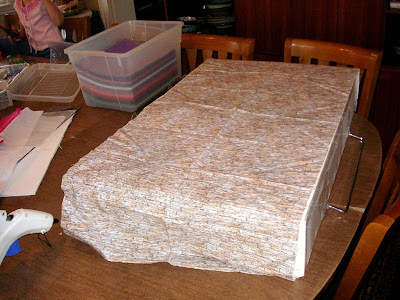 To make a shingled roof, we chopped many, many, many shapes from a brown paper shopping bag. We used a diamond-shaped hole punch. This can be done with any shape. Emily had a lot of patience. She kept at the shingle-punching for over half an hour. 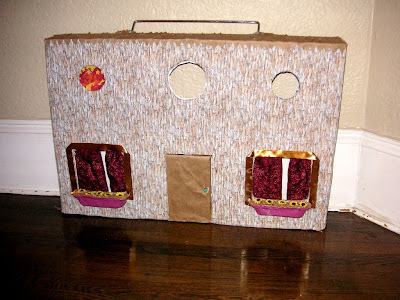 She used two brown paper shopping bags to make enough shingles to cover the roof (and cover the door) of the doll house. I attached them with the hot glue gun. For the carpets and floors, we sacrificed a couple of bleach-stained washcloths and a ribbon remnant. 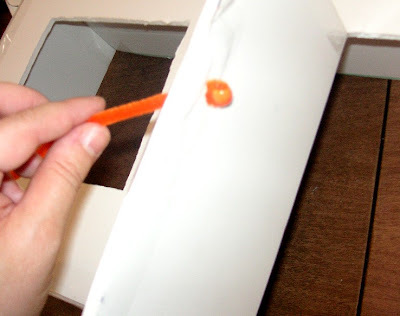 Removable 'curtain rods' were made by attaching two pony beads to the edges of the window frames, using the hot glue gun. A pipe cleaner serves as the curtain rod. 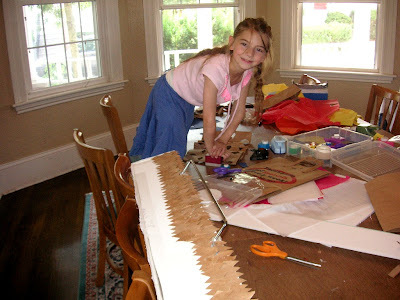 Emily chose her favorite gift wrap patterns, and then we used the gift wrap scraps patchwork-style as wallpaper. 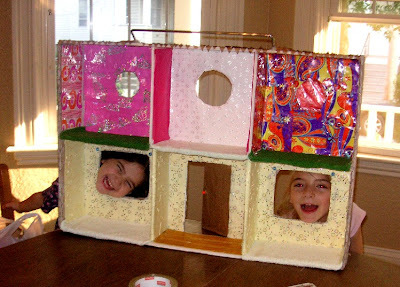 We also used some pink tissue paper, folded over a couple of times, on the side walls in the top floor middle room, and some craft paper on the first floor. Note the "stained glass window" (installed before the wallpaper, so that the wall paper covers and defines the edges) in the upper right hand room. 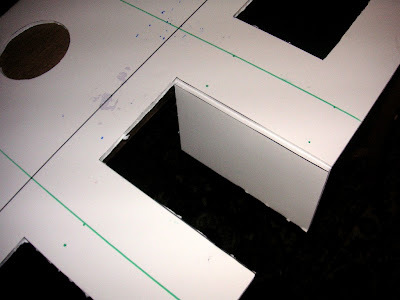 To make matched flower boxes, chop 1.5" deep edges from a foil pan. 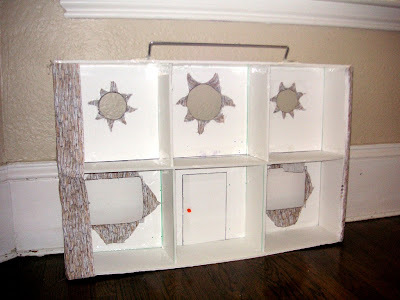 Paint and decorate before attaching to the outside of the windows with the hot glue gun. My kids like their dolls to be Orthodox Jews. 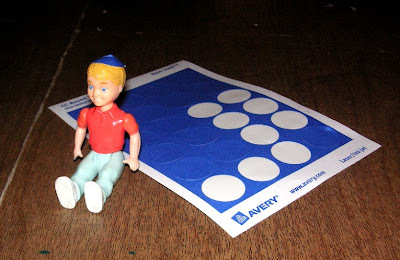 We have been using file label dots as kippot (yarmulkes) for many years. If we have white dots, they like to draw on them, pretending to "knit" the boys' kippot. Here's the completed front, with the flower boxes. I couldn't get them to stop playing and look up at the camera. They had waited all day to play with it, I didn't insist! by Juggling Frogs at 7:23 PM 17 comments, so far. Add yours now!